Thank you - I will have something to enjoy for a life-time. "The ring looks great and the whole process was excellent. I really appreciated the CAD program you used. I had visited other jewelers who used that same company but none had the program you use. It really gave that "perfect" design element so my wife could get the ring she really wanted. The tools like the ring on the hand visuals also helped the process. Thanks again for the excellent service and great value." Working with Mike was a pleasure. From the very beginning we discussed multiple options for engagement ring and wedding band designs. After reviewing numerous ring, band, and diamond options, we decided to deviate from the standard designs commonly found in stores and pursued a custom design. We entrusted our own hand-sketched design to Mike because of his professionalism and commitment to making sure that the design was brought to life with complete satisfaction. Mike met with us multiple times during the design process to review the wax carving progress to confirm that we were satisfied with his work. Upon completing the wax molds, he kept us informed on the casting process and the final detail work he performed prior to us receiving the completed ring and band. The overall process of the custom design went smoothly and was completed timely. The quality of the ring and band is as high as could be. The overall price of our ring and band were equal to that of standard rings and bands (with comparable diamonds and gold weights) that are all too often found in stores. If you are looking for a ring that will be uniquely yours, we would highly recommend Mike. Even without a sketch of your own, Mike’s years of experience can help you develop a personalized design you will be happy with. Knowing that we were able to take our own sketch and transform it into a symbol of our love will always make our ring and band unique and special. Thank you Mike. "We were referred to Mike byanother couple who had a verypositive experience workingwith him on their engagementring. We wanted a ring madeusing diamonds that had beenin each of our families forgenerations. And we had a specific design in mind. It was such a comfort to workwith Mike on our ring. Notonly is he very talented, but heputs so much thought and careinto every step of the process. We trusted him completelywith the design,construction, and thedelicate handling of ourfamily jewelry . We were solucky to find him. The endresult is a beautiful and uniquering that means so much to us,and brings me complimentswherever I go! We lookforward to using Mike in thefuture and can't recommendhim any higher!" I truly enjoyed working with Mike on my wife's engagement ring and both hers and my wedding band as well. Mike isalways willing to meet at your convenience, provide all information necessary to making a decision on a piece, and alwaysmaintains a level of sales professionalism that you would expect from any jeweler. Working with a private jeweler is amazing as you are able to get quality time working with Mike and he is able toget to know you on a personal level. He creates a low pressure and welcoming environment out of his home office, and notonly gives his professional input, but his personal input on your decision using his years of experience. Not to mention, the value you get working with a private jeweler cannot be matched by a larger company ... (comparedrings ... the prices were almost 2x Mike's prices for similar style and diamond weight and characteristics). He is even ableto beat wholesalers. Spend quality time with the jeweler, no sales pressure, and best value/low prices you can find... Self-explanatory tochoose Smale Jewelers! Working with Mike was a pleasure . From the very beginning we discussed multiple options for engagement ring and wedding band designs. After reviewing numerous ring, band, and diamond options, we decided to deviate from the standard designs commonly found in stores andpursued a custom design. We entrusted our own hand-sketched design to Mike because of his professionalism and commitment to making sure that the design was brought to life with complete satisfaction. Mike met with us multiple times during the design process to review the waxcarving progress to confirm that we were satisfied with his work. Upon completing the wax molds, he kept us informed on the casting process and the final detail work he performed prior to us receiving the completed ring and band. The overall process of the custom design went smoothlyand was completed timely. The quality of the ring and band is as high as could be. The overall price of our ring and band were equal to that of standard rings and bands (with comparable diamonds and gold weights) that are all too often found in stores. If you are looking for a ring thatwill be uniquely yours, we would highly recommend Mike. Even without a sketch of your own, Mike’s years of experience can help you develop a personalized design you will be happy with. Knowing that we were able to take our own sketch and transform it into a symbol of ourlove will always make our ring and band unique and special. Mike Smale worked on getting me a custommade "Push" present that included gems anddiamonds that I provided. The pendant he mademe came out fantastic and was exactly what Iwanted. Not only was he extremelyprofessional, but he was very friendly and youcan definitely expect me to work with him againwhen I need another piece of jewelry. ThanksMike! diamond I wanted not guessing at a retail store. The price range I requested was dead on and I could not have been happierwith the results. I would recommend Mike " VERY HIGHLY" for QUALITY and CUSTOMER SERVICE. Very professional and you getwhat you want. Didan awesome job with ourrings. Mike was a pleasure to work with. He was flexible with appointmenttimes, meeting with us on the weekend since we don't live close by. Verypatient as we rolled through various options, listening and presentingdifferent rings and ideas to help us hone in on our perfect rings. Morerelaxing than sitting in a mall store and I am sure a better value for theend product. Even offered to work on designing a custom ring, but wefound what we wanted in the standard offerings. Have no reservationsrecommending Mike to any bride and groom to be. 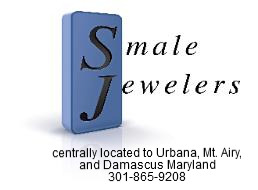 To get one on one professional experience,I highly recommend Smale Jewelers. Youtruly get what you want. Very fair pricingfor exquisite craftsmanship , SmaleJewelers cares more about the product andyour happiness then the price tag. Willreturn for future jewelry needs. Mike was very flexible and welcoming,and let me explore each of my whims untilI was satisfied we were getting the rightdiamonds and ring. Mike kept me in theloop throughout the entire process andmade it feel like I was buyingthrough family . Bottom Line: my fiancéis still ecstatic with the final choice twoweeks later! I was looking for an engagement ring for my girlfriend at the time (now fiance) and washoping to find a local knowledgeable jeweler who I could trust. At the time I knewrelatively little about engagement rings, and after reading several positive reviews forSmale Jewelers decided to contact them. At our first meeting we discussed what Isuspected my fiance was looking for, the general "process", as well my price range. Followingthis meeting Smale Jewelers found several diamonds that fit my criteria, and at a latermeeting we looked at each and he discussed the pro's and con's of each. What is uniqueabout Smale Jewelers is that at this point a band can be designed to create a one-of- a-kindring (though as expected the more work required to design the band, the higher the price). Smale Jewelers was extremely approachable, responsive, and sensitive to my constraints. Iwould highly recommend Smale Jewelers, particularly if you are looking for somethingunique.